Those are the words of North Dakota State Representative Jim Kasper speaking about his party when it comes to internet gambling. 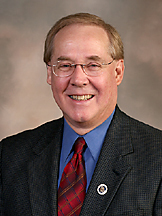 Kasper, R-Fargo, had promoted a bill and state constitutional amendment during the 2005 Legislature to allow North Dakota to license and regulate online poker sites. His bill resembled the way the UK Gambling Act will regulate and tax online gambling and protect its citizens when it goes live in 2007. Kasper believed that by regulating the online poker industry in North Dakota that the license fees generated would have covered the costs for all state public services and reduce property taxes. He also believed that the state-owned bank of North Dakota would have been able to make profits since they would be the only bank allowed to handle North Dakota-licensed online poker transactions. The thinking behind Kasper’s bill was similar to the revolution the credit card industry underwent a couple of decades ago. And by addressing new laws and regulations, the Dakotas were on the front lines of a credit industry boom. Other states quickly followed when they caught wind of the money being made. That’s why today you have the number of choices and rates offered in a variety of credit products. But, for now, protectionism won over vision.